Netflix has renewed its Atypical TV show for a second season. While the first season — which just premiered on August 11th — consists of eight half-hour installments, Deadline reports the streamer has ordered 10 episodes of Atypical season two. Writer Robia Rashid created the Autism Spectrum Disorder comedy-drama and executive produces with director Seth Gordon. The Atypical TV series stars Keir Gilchrist, Jennifer Jason Leigh, Michael Rapaport, Brigette Lundy-Paine, Amy Okuda, Nik Dodani, Jenna Boyd, Christina Offley, Wendy Braun, Gino Montesino, and Rachel Ashley Redleaf. This Netflix coming of age comedy centers on Sam (Gilchrist), an 18 year old on the spectrum. As he searches for autonomy, Sam’s family must to come to terms with the resulting changes to their lives. What do you think? Have you checked out the first season of Atypical? Did you expect it to be cancelled or renewed for season two? Will you return for the second season, when it drops to Netflix? Let us know, below. 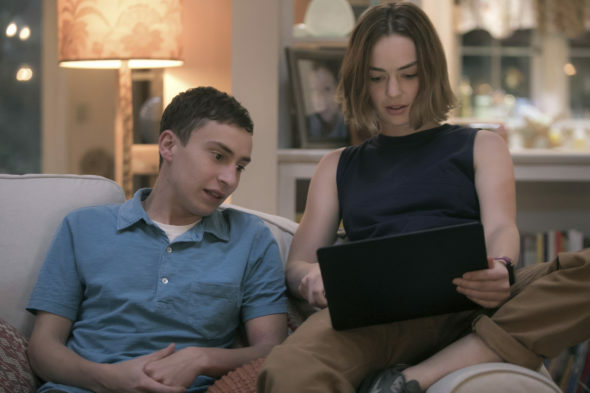 More about: Atypical, Atypical: canceled or renewed?, Atypical: ratings, Netflix TV shows: canceled or renewed? Atypical: Season Three? Cancelled or Renewed by Netflix? Atypical: Cancelled or Renewed for Season Two on Netflix? LOVE IT!!! really looking forward to season 2!! !